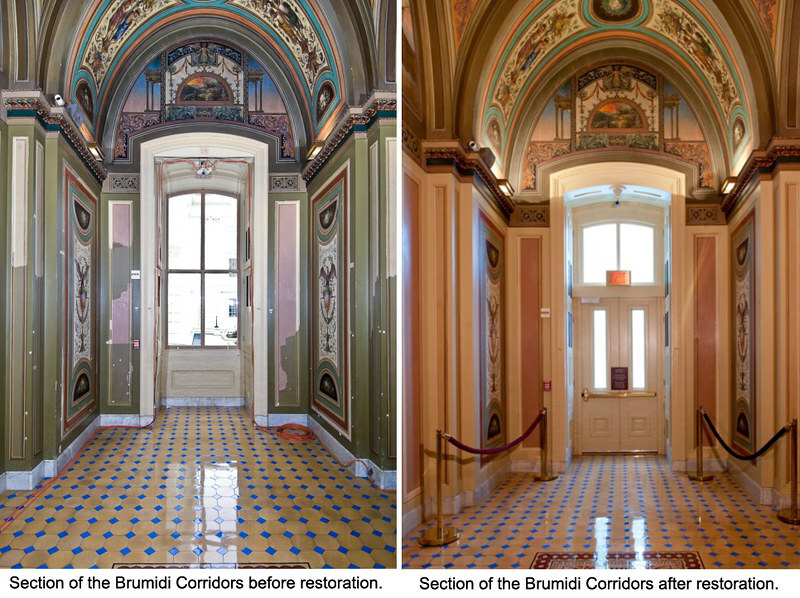 In 2017 the Architect of the Capitol completed a long-term conservation effort to restore the murals of the Brumidi Corridors on the first floor of the U.S. Capitol's Senate wing. The corridors designed and painted by Constantino Brumidi, and other artists, from 1857 to 1859, are intricately decorated from floor to ceiling. Although many artists contributed to their painting, they are often called the Brumidi Corridors. The murals depict hundreds of animals, insects, flowers, fruits, classical figures and symbols, and historical portraits and scenes. Because the corridors are a high-traffic area, their corners and walls are constantly being damaged and repainted; in fact, this process began soon after they were finished, and they may have been first repaired by Brumidi himself in 1861. Over the years, the varnish applied to protect the walls significantly yellowed with time and the background fields have been repainted without being cleaned to match the yellowed varnish and grime, obscuring the original colors and many of the beautiful details. The decorations originally described as predominantly red, white, and blue became yellow, tan and murky green. In the 20th-century, even Brumidi's historical frescoed scenes were painted over when damaged or darkened with grime. Over the years, professional conservators trained in fresco conservation in Italy have removed layers of overpaint and uncovered the original designs and colors of Brumidi's frescoes and murals. Where the plaster became detached, consolidants were injected into the cavities. In order to saturate powdery plaster with the consolidant, a system of hanging bottles and tubes controlled with valves was developed to introduce the specially formulated consolidant and a slow and steady rate. This consolidation is necessary to allow the conservators to safely remove the overpaint. Missing details and areas were reconstructed using reversible paints. The trompe l'oeil moldings around the panels were discovered to be mostly intact and are uncovered. The plain borders, formerly a murky green, are repainted to their original sandstone color; the use of electronic instrumentation allowed accurate matching of the original colors. The last step was to replicate the shadows around the panels and the illusionistic moldings on the pilasters. Over time, the conservators discovered a variety of paints and a variety of problems in different sections of the corridor. Some panels lay in almost perfect condition under the overpaint, while others were severely damaged and had been replastered, with no original to be found.